The latest example of America’s legal system being a total circus might actually help you out–if it doesn’t swindle you first. In 2006, Pablo Ramirez took out a private loan to attend Westwood College, a now-shuttered for-profit diploma mill in Fort Worth, Texas. Eight years later, he got a court document in the mail: Without his knowledge, he said, a company called National Collegiate Student Loan Trust had won a judgment against him for defaulting on that loan and was demanding roughly $50,000. When Ramirez challenged the ruling, he learned something even stranger. National Collegiate did not seem to have any actual evidence it owned the debt. The judgment against Ramirez was eventually overturned this March because National Collegiate “had failed to demonstrate that it was the holder of the note,” as an appeals court found. Ramirez hadn’t kept up with his payments, but at least for now, he’s off the hook. Thousands of private student loan borrowers may find themselves in the same situation, according to a massive New York Times report this week that’s bringing new attention to a uniquely American legal nightmare. At least $5 billion in defaulted loan debt might not be collectible, potentially bailing out tens of thousands of student debtors. If this sounds familiar, that’s because it is. One of the huge problems America had to deal with in the mortgage market after the collapse of the housing bubble in 2007 and 2008 centered on something called “chain of title.” Millions of securitized mortgages lacked these “chains,” essentially the ownership record passed down from sellers to buyers. Banks covered for this glaring mistake by mass-producing false documents to paper over inaccuracies. Judges mostly played along, but they haven’t given National Collegiate the same courtesy. 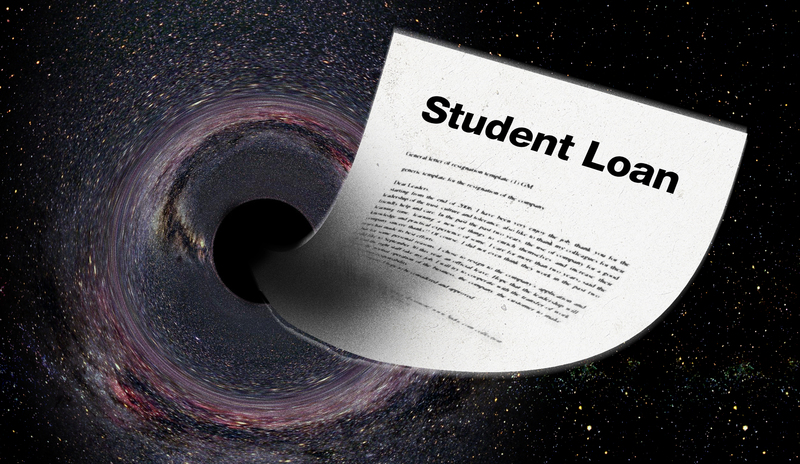 So far, this student loan mess only seems to affect some private loans, which represent about 7.5 percent of the total student loan market, according to data collected by analyst Measure One. Private loans were mostly phased out in 2010 after the feds took over the market; they’re primarily used today to attend sketchy for-profit colleges that, by law, cannot rely entirely on federal financing. Many of these for-profit college loans, which target vulnerable students, have been found to be deceptive. Before 2010, private student loans were often securitized, just like subprime housing loans before the financial crisis. What this means is that a student would take out the loan, and the lender would bundle it with hundreds of others and sell them through multiple transactions into a trust. The trust would then issue bonds based on the student debt and sell them to investors around the world. The trust would then hire a servicer to take in monthly payments from students, and that money would pass back to investors. This is where National Collegiate got into trouble. According to an audit of the company’s loan servicer, the Pennsylvania Higher Education Assistance Agency (PHEAA), National Collegiate never received assignments of the loans in its trusts, which would establish the transfer of ownership. In fact, “100 percent of the accounts did not contain an assignment,” the audit found. How could this be? Why would a company buying hundreds of thousands of loans never secure the proper paperwork showing they actually owned them? The audit hints at a reason: money. The lender assured National Collegiate and its servicer that it could figure out ownership documentation after the fact–if needed. “This became a standard process as it was a less costly option,” according to the audit. After all, many people with student loan debt don’t challenge default judgments, so it made some sense for National Collegiate’s powers that to be to think cutting corners wouldn’t be too costly. Now that might change. Already, in case after case, from New Hampshire to Ohio, the lender has been found to not actually have possession of the documentation necessary to prove ownership. In hundreds of other instances, according to the Times, National Collegiate has been dismissing cases as soon as they’re challenged to provide docs. That means Pablo Ramirez and other borrowers who stopped paying their loans are getting off scot-free. All of this might sound vaguely unfair. Why should Ramirez get a break when millions of other former students have to pay? Well, just like borrowers have obligations (to pay their debts), so, too, do lenders. Pablo Ramirez didn’t force the company that took out his loan to engage in multiple complex transactions and then forget to turn over the ownership documents. If National Collegiate is going to aggressively pursue borrowers who fall behind on their loans, proving it owns the debt in question seems like a pretty barebones ask. Without that requirement, I could walk into a court and announce that Pablo Ramirez–or, for that matter, Donald Trump–owes me money. The system of commerce America has established for centuries relies on proof of ownership. It’s been thrown into disarray in the last few decades, but in theory, at least, this is still how things work. The real problem here is the near-total lack of accountability for financial companies lending people money in America. In fact, despite numerous no-fault settlements, banks continue to fabricate documents and kick people out of their homes based on false mortgage evidence. It’s no surprise that these tactics have begun to migrate to other kinds of loans. JPMorgan Chase was fined $136 million two years ago for selling credit card debts to collectors with inaccurate and fabricated information. Now we’re seeing the shady behavior crop up in student loans, and you can be virtually certain that National Collegiate isn’t the only offender. What this comes down to is America failing to defend property records laws by imposing real consequences on violators. In that sense, it was all too predictable that ownership records, from housing to student loans, would turn into cesspools. And it’s worth bearing in mind that way more borrowers are harmed by this chaos than are bailed out. Maybe someday we’ll hold companies like National Collegiate as responsible for their obligations as we do borrowers who aren’t quite as lucky as Pablo Ramirez.